School, a photo by megan_n_smith_99 on Flickr. It's been pouring for days in Seattle and I think my next painting might have to be of fish swimming through the air. I have not needed to go many places this week but I sure was grateful for my cute rain boots. 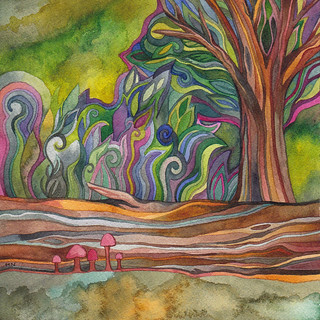 This painting was sort of inspired by Ray Troll, and artist whose work I love. But of course I had to do my own style. 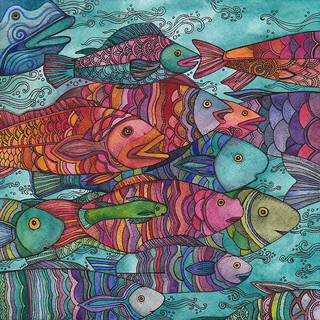 I've done some other fish paintings in the past, such as this and this. I have a feeling there will be more fish in my future. Quartet 2, a photo by megan_n_smith_99 on Flickr. 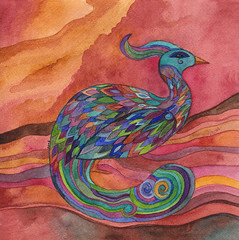 Another bird painting. I do like painting flowers and birds. 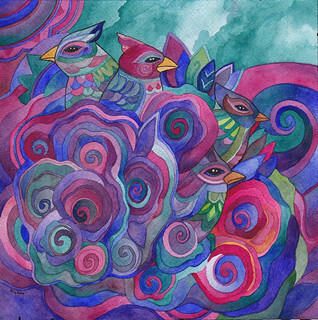 I am trying to expand my repertoire, but painting birds and spirals and swirls is sort of like eating rice pudding. it's comfort painting. I managed to miss the worst of the rain today, thank goodness. I stopped by the bead store to pick a couple things up to finish a project you will see in a day or 2. i have discovered the way to spend less money at the bead store is to misplace you reading glasses. if i can't even tell what it is, how can i buy it? anyway another way to economize - i am trying to live frugally but i can't get along w/o art. fortunately i got lots of art paper for christmas! it will keep me going for a long time. ok, back to making-things. you can see Quartet 2 on Etsy. 8 x 8" is a standard frame size. 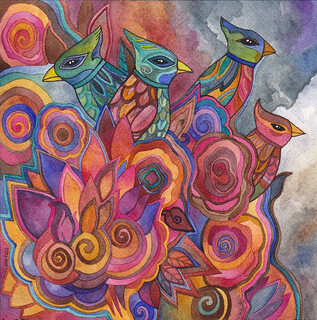 A bird painting would be an unexpected mother's day gift. Quartet, a photo by megan_n_smith_99 on Flickr. 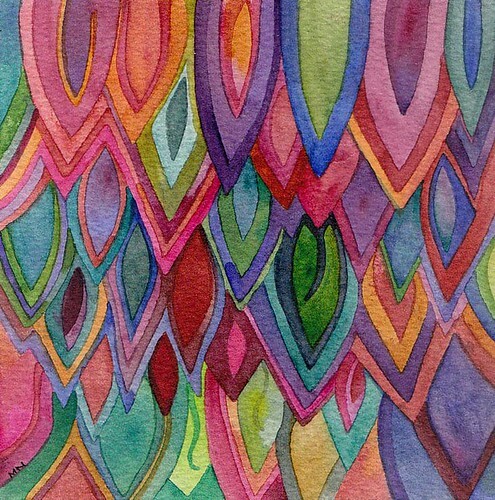 This is an Arches watercolor block, 140lb, cold pressed. I've been wanting to paint birds a lot - it must be spring. I've seen a few birds drifting back but I have not seen many yet. In the winter mostly I see crows and seagulls and perhaps a few chickadees who had located a steady food source and we too bird brained to head south. 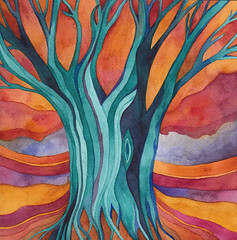 I am going to have paintings at Capital Hill Presbyterian Church in April. They participate in the Capital Hill Artwalk - aka Blitz. That's the 2nd Thursday of every month. I will provide more details in a day or two! Nurse Log, a photo by megan_n_smith_99 on Flickr. this painting reminds of of some of the things I love about the Northwest. Endless trees and endless green, any time of the year. Across the sound from me is the Olympic Rainforest, where the wettest parts get 200 inches of rain a year, while the town of Sequim (rhymes with him) gets only 15 inches of rain a year. When an old tree falls in the forest, the fallen log can become a "nursery" for seedlings and other plants, such as moss and ferns. As the log decays it provides nourishment for young plants, continuing the cycle of life. The flowering of Spring, a photo by megan_n_smith_99 on Flickr. 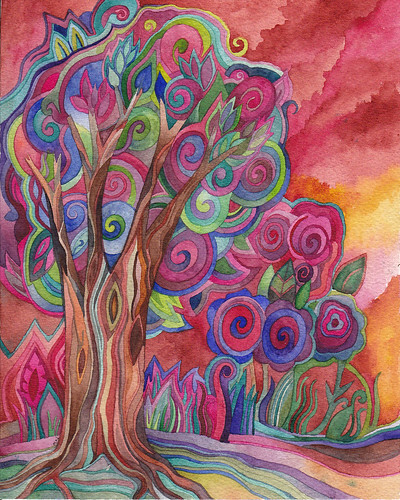 When I did this painting I penciled in the outline of the tree, but the rest was all free hand, or free form, or flow of consciousness - all sort of spiraling out from the tree bark. Tree bark is one of my favorite things to paint - that and hair, I guess. I love all the sinuous lines and earthy tones. Handwoven silk shawl at Nordic Heritage Museum, a photo by megan_n_smith_99 on Flickr. A couple of days ago my mother and I went to the Nordic Heritage Museum in Seattle to see the show Celebrating 75 Years of the Seattle Weavers’ Guild. This is a photo of the piece my mother had in the show. This gorgeous shawl is hand woven from silk and I think has about 1 million ends to the inch, or something like that anyway. Isn't it beautiful? And it has a lovely drape - I know this because I have one just like it that she wove for me, presumably on the same warp. My sister has a red and black one. 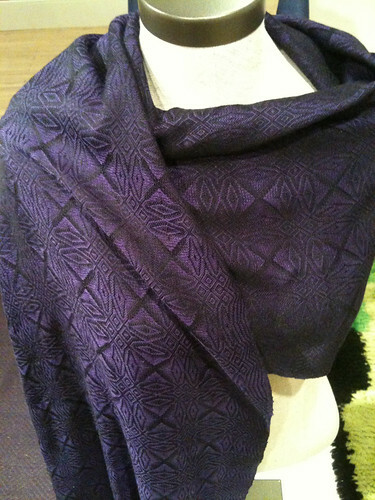 There were many handwoven items in the show - wall hangings, dishtowels, aprons, shawls, pillows, rugs, and more. It was all absolutely beautiful. There are a lot of very talented weavers in the Seattle area. My mother joined the guild when we moved to Washington state, in 1978 it must have been. The show is up until May 6th. If you are in the Seattle area, you should go and see it. There are even looms set up where you or your child can try a little weaving of your own. It's been a good weekend. It was snowing yesterday morning, which is ridiculous for Seattle in March. I went over to visit my friends Alex and Janusz. We just sort of lay about on couches and drank tea and watched a little TV. They introduced me to The IT Crowd and Black Books. A good change from the darker British dvds I've been watching (Mi-5). Then I went home and curled up with a volume of Neil Gaimain short stories - Fragile things. It was quite enjoyable. A lot of the best short stories have a non-traditional structure, and there are plenty of gems in that book. Peacock at Sunset, a photo by megan_n_smith_99 on Flickr. I was happy with how this painting came out - which was a good thing - it was a reworking on an idea from earlier this week. but THAT painting tore when I removed it from the watercolor block. It was so annoying! I have not had that happen before! And of course I can't really copy another painting - I can TRY - i am capable of it technically - but my brush always wanders off in new ways I did not know it intended to go. I suppose that does at least make life interesting. At the Bottom of the Garden, a photo by megan_n_smith_99 on Flickr. This is not a very good picture. I will try again when there is more light! Really I need to go to Kinkos and see if they have a way to scan something this big. Perhaps a blueprint scanner? 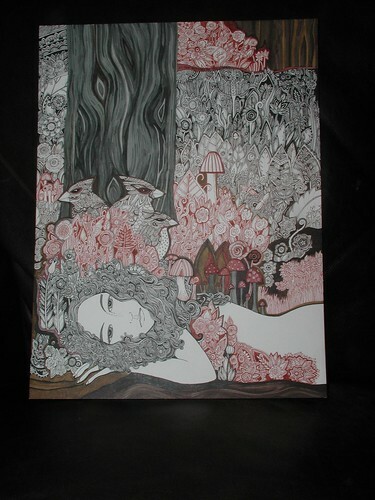 This is the 2nd large pen and ink drawing I've done this year. It's 16 x 12 inches. I used pitt pens, which I love. I started a new painting last night, while listening to the audio book of Midnight for Charlie Bone by Jenny Nimmo. I've series, a few years back. They are fun books and a bit less scary than some of the later Harry Potter books, if you are looking for something for a "tween" child to read. I love books of all kinds really, and gladly admit that I still read and listen to kids books. ...we wake, if ever we wake, to the silence of God. “We sleep to time's hurdy-gurdy; we wake, if ever we wake, to the silence of God. And then, when we wake to the deep shores of time uncreated, then when the dazzling dark breaks over the far slopes of time, then it's time to toss things, like our reason, and our will; then it's time to break our necks for home. Peacocks in the Garden, a photo by megan_n_smith_99 on Flickr. This is my latest. I was quite pleased with how it came out - though the colors are brighter in person than they came out on the scan. When I started it I knew it would be green and spring-y but I did not know about the peacocks till I was a ways in. When I look out my window right now the colors are all grey-ed down with rain. The brightest colors I can see are a couple of red cars and a yellow excavator down the street. Everything else seems grey or brown or taupe and washed out. there are some pine trees, standing like shy sentinels, but they seem to recede into the background somehow. Sometimes you have to make your own color. Branches, a photo by megan_n_smith_99 on Flickr. It has been a quiet weekend. Friday evening I painted while listening to the Narnia audio books. I am up to the Horse and His Boy. Not my favorite of the books but still enjoyable. Actually I think The Magician's Nephew was my favorite, followed by The Lion the Witch and the Wardrobe. Then yesterday I was a bit useless. That's what you get when you stay up till 4am reading. I never meant to but I got sucked into the book I was reading - The Butterfly Cabinet by Bernie McGill. It was pretty good - sort of moody and gothic - but somehow did not quite all come together as I thought it would. So I was tired yesterday and not good for much. I did read a little Neil Gaiman (short stories) and did some hand sewing and knitted some while watching MI-5. I am up to season 5 and they continue with their tendency to kill of or otherwise dispose of main characters left and right. In some ways it's a stronger show because of that - I mean it's not very realistic to put people in mortal danger continuously and then NEVER have any of them suffer and permanent damage- but still it's rather intense. It is a good series, I am enjoying it. I hope to get some art done today! And perhaps some laundry. I am fascinated by the beautiful branches forms in nature - trees, wave patterns at the beach - a river delta seen from above. And.. finally, the winner of this month's give-away is Faith! 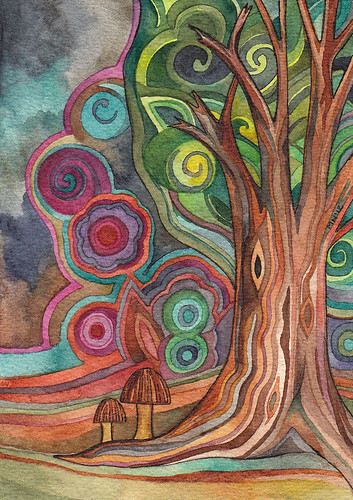 Check back around April 1st for your next chance to win a small piece of art! You've still got a couple days to comment on This post for a chance to win one of my paintings! Amid Steam, a photo by megan_n_smith_99 on Flickr. This is my latest painting. 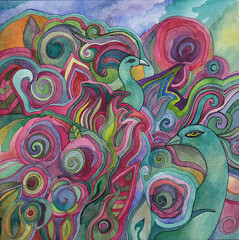 It's 8 x 8 inches, watercolor and ink on paper. It's available on Etsy. I spent a couple of days visiting friends this week. It certainly is a very different life than what I am used to, raising 2 small children. They are both delightful but they have so much more energy than I do. I always enjoy listing to whatever strange stories Ingrid has invented and in watching Finn grow (almost visibly!) and learn new words. But now I am home with some things to do. I'd love to paint all day but I need to make myself do a few other things first. 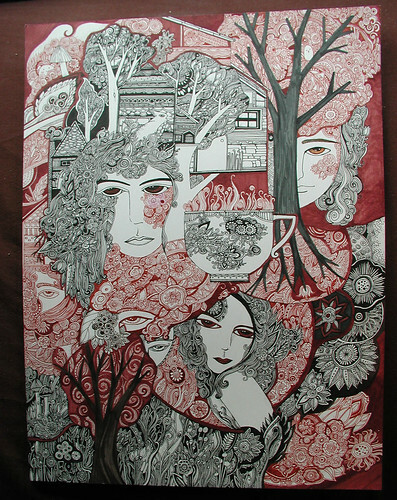 I'm also working on another large pen and ink drawing I'd like to get back to. We shall see what there is time for! Cat and Mouse, a photo by megan_n_smith_99 on Flickr. Yesterday I did not feel very well. i did draw and crochet a bit while lying in bed listening to Kenneth Branagh read The Lion The Witch and The Wardrobe. 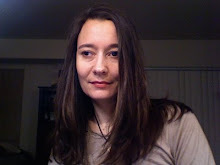 I am not feeling well today either, but I am going to try to rouse myself enough to run a few errands and do a few chores. Sweet Tea - March Giveaway. Sweet Tea, a photo by megan_n_smith_99 on Flickr. Hello and Happy Sunday. I think I will be starting with a cup of Pangiallo from the Tuscan Tea Room. I have gotten into sleep pattern I don't care for but I must wake up. And then remember to stop drinking caffeinated tea early! So, inspired by yesterday's round of delicious iced teas, we have the March giveaway. 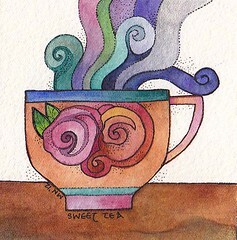 Comment here for a chance to win this little tea painting. 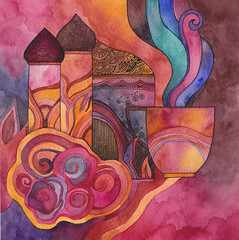 It's 4 x 4 inches, watercolor and ink on arches watercolor paper. I will randomly select a winner next Sunday, March 11th. 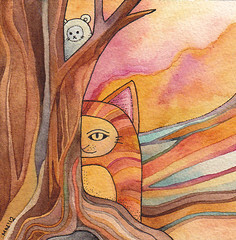 I've also listed a new Orange Kitty (and mouse) painting on Etsy - take a peek! Yesterday had some lovely sun breaks and I had dinner with friends. Today I need to Get Stuff Done. if you know that feeling. i am not motivated, alas, by a feeling of confidence and energy, but i do need to apply myself! Tree, a photo by megan_n_smith_99 on Flickr. I finished this painting earlier today. It just needed a few touches. When I started it I had no idea the sky would get so moody and brooding. It could be an April tree, though It's barely March... Anyway, it's available on Etsy. After having been so much a hermit as of late I saw two friends today. I had tea at Miro with a friend this morning and Janusz came by this afternoon and brought me some of my very favorite tea which you can only get at the Tuscan Tea Room. We drank some (other) iced tea and discussed books and things as we do. I borrowed The Kite Runner and The Bone People. He borrowed a couple but I already forget what - good thing I trust him! Now it's time to unwind and paint a bit, then probably read a bit. I've gotten my body clock out of wack a bit and I need to readjust it. So why did I eat a few chocolate covered espresso beans earlier? Oh, dear. That was not a good idea. Entangled, a photo by megan_n_smith_99 on Flickr. This is my latest pen and ink drawing. It's the largest pen and ink i've done in years and as you might imagine, it took a while. I worked on it between other projects. The paper is actually a hot pressed watercolor block i ordered by mistake and didn't like for watercolor, so I thought i'd use it for pen and ink because it is arches, good paper! It's 16.25 x 12.25 inches. Today was a good day. I've not been feeling well this week and the weather has been pretty awful so I had not ventured further from home than the post office. Today I had coffee with a friend and then ran some errands. There were even a few spots of sunshine!